The notice had been given and the introduction made, and now cross-device advertising has arrived. In truth, cross-device advertising -- or cross-devicing, since everything needs to be shortened or acronymed these days -- arrived long before this column, but some new data, and some recent news headlines, says it’s now here in full force. A couple of weeks ago, Lotame, a data management platform (DMP), announced an upgrade to its platform to allow marketers to link data from multiple devices in a bid to support cross-device campaigns, which marketers are eager to run. AOL’s new DMP revolves around identifying audiences across screens, and some companies that have built their entire company on cross-device advertising, such as Drawbridge, have recently made upgrades to help marketers better understand audience behavior across devices. “Cross-device targeting is becoming the new normal for DMPs,” read a Real-Time Daily article a few weeks back, and for good reason: marketers are flocking to cross-device campaigns, and are using programmatic ad tech to help them do so. "This trend is due to the rapid development of marketing technology and the addition of mobile into the advertising mix," commented Joe Stanhope, SVP of marketing at Signal (formerly BrightTag). "Advertisers are responding to consumer adoption of mobile and the arrival of mobile as a significant channel for e-commerce and transactions." A new report from Videology, a programmatic video ad platform, notes that 35% of U.S. video campaigns in Q3 2014 ran on multiple screens, up 59% quarter-over-quarter. All of the data in the report comes from programmatically-purchased ads -- over 2.2 billion of them, to be exact. 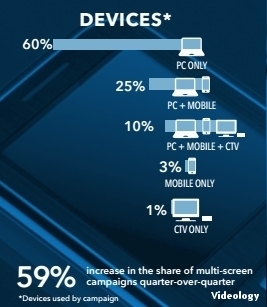 Campaigns running on PC and mobile devices increased from 17% to 25% quarter-over-quarter, per the report, and campaigns running on PC, mobile and connected TVs increased from 5% to 10%. “In this fragmented media world, it’s clear that marketers see the value in using data to reach their consumers across the many screens they’re interacting with each day,” stated Scott Ferber, chairman and CEO of Videology. Stanhope explained that cross-device advertising requires data collection from across Web, mobile and offline environments to match customer profiles across devices and channels. He believes "marketing technology has evolved to the point where it's possible to do all three of these things," but added that "most marketers aren't quite there yet; their data still exists in fragments across the data silos in their technology stacks." Marc Poirier, co-founder and EVP of business development at Acquisio, agrees that data -- or lack thereof -- can complicate the switch to cross-device campaigns. "Cross-device advertising with any kind of accuracy requires buying media through platforms with login requirements and wide ranging adoption, such as those operated by Facebook, Google and Microsoft," he said. "The limitations are that the tracking is limited to a user's interaction with media inside one of those platforms, nothing credible exists to target and manage media across devices and across platforms." If the current growth rate of cross-device campaign use continues, it won’t take long for the majority of video campaigns to be targeting audiences across screens, at least on Videology’s platform. If cross-device campaign use jumps another 59% in Q4, then over half (55%) of all video campaigns on Videology would be running on multiple devices. Tyler Loechner is a MediaPost Reporter covering real-time, programmatic, RTB and more. You can reach Tyler at tyler@mediapost.com.